Almost a month ago, a campaign by the name of ‘Action on Poverty’ was launched with a prominent ad in this very newspaper. It was an initiative from Equality Rights Group with a strong underpinning in building coalitions across Civil Society, which is what we do, and how we work. A non-partisan umbrella where all involved retain their singularity but strengthen each other towards a common cause. A campaign of collective ownership. It may seem simple. And yet, like so much of our work, it didn’t exactly drop from the firmament and onto our laps; it took a lot of preparation and hard work. It was rooted in 18 months of very solid research by ERG in this community. We dug deep, using reliable and valid statistical approaches in order to research the realities at play in Gibraltar. Lamentably, Gibraltar public statistics are woefully absent and insufficient in so many important areas. They yawn at anyone attempting to understand how our society works – or doesn’t. And we were faced with the task of needing to contrast what we’d been witnessing through thousands of close up and personal case work interviews over the almost two decades of our activism in this community, with hard facts on the ground. So, do we have poverty in Gibraltar? We do! Islands and pockets of poverty across the short- and long-term unemployed, the private sector; across those recognised as disabled but not deemed to be disabled ‘enough’ to qualify for assistance; affecting the elderly who do not care to be ‘disgraced’ by speaking up and out, and others more subtly in the undergrowth of ‘shame’. And this reality permeates through a radius that affects children, divorced women, those with serious medical and psychological problems. It’s one single cause that radiates and morphs across many categories, underlying them silently and, to date, voicelessly. We regularly deal with them as headline manifestations, and too often fail to notice the foundations on which the problem has been built. All our politicians have a responsibility to stop it. It’s too basic for it to be simply continuing year after year, with the odd cosmetic patch here and there. 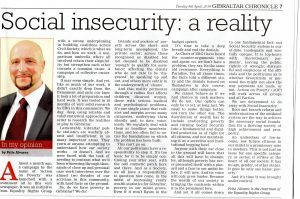 And as a Society, we all have a responsibility to question how come, in the midst of increasing yearly wealth statistics for Gibraltar, poverty in our midst grows. Even if it won’t figure in the budget speech. It’s time to take a deep breath and end the denials. As Chair of ERG I have heard the counter-arguments time and again: no, we don’t have a problem, they say. Its the same old resistance. Everything is Paradise. Yet all those times, the facts told a different story and the denials turned on themselves in due course, campaign after campaign. We cannot behave as if we had choices in such matters. We do not. Our option can only be to act, at long last. We need to make things better, not turn the other way. The distribution of wealth has to include eradicating poverty and turning Social Security into a fundamental and dignified protection as of right for all citizens, and not maintaining it as a secretive and institutional begging bowl. Anyone with their ear close to the ground will know that all this will have to change; for, although poverty has never presented itself with a placard and a face in our midst before, it will now. And its voice will only grow louder. Because the wealth of our society is bringing the contrasts within it to the prominent fore. And yet it all comes down to one fundamental fact: our Social Security system is out-of-date, inadequate and woefully opaque. It is top-heavy with ‘discretionary payments’, leaving the public, rightly or wrongly, distrustful and suspicious of the officials and the politicians as to whether favouritism or personal ties might not skew the way payments are made, or not. Action on Poverty (AOP) will work across all groups and all Parties. We are determined to do away with Social Insecurity. Root and branch reform and modernisation of the outdated system are the way to achieve the necessary social foundation for a thriving society of high achievement and prosperity. An underclass of low-income, low future citizens in our midst is a promissory note to nowhere. This is not just an issue for one specific category or sector, it strikes at the heart of all our society. It has no age, gender, or other status. It goes by only one name: poverty. And it’s time it was brought under control.